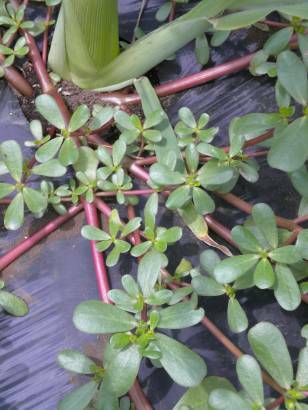 The other day while removing the plastic row covers from the sweet corn field I noticed purslane growing among the stalks. As an edible weed it, like dandelions, inspires mixed feelings. Some don't mind it, some see it only as a nuisance, and others harvest it like mad. I would say I fall somewhere in between. I don't really mind it, but it can get to be a bit overwhelming in the garden. And even then I sometimes leave it to act as a living mulch. This year I've given in and am using the farmers recommended plastic mulch. Incredibly strong winds and heavy rains can quickly erode valuable topsoil here, not to mention the somewhat long hot, dry spells that come as the spring turns into summer. Purslane doesn't ask for much - hence, it's now naturalized state - so it isn't using valuable nutrients that other garden crops might need. The seeds are viable in the soil for about five years, so it's also bound to rebound even after a heavy harvest. It's so ridiculously good for you and tasty that it seems like a no-brainer to eat it. (Not to mention I didn't have to do anything to encourage it's growth.) If I feel it's getting a bit out of control I harvest a big bundle and take it home to add - stems and all - to salad. One grower made what sounds like a fantastic stew from a good round of weeding. I'm just amazed at all the things we are able to eat from a garden. There is a particular green which grows in Malaysia- mainly around drains etc- but we harvest it and it makes a tasty vegetable. What's the name of the green, Anjuli? I love hearing about edible wild things. Friends of ours who run One Life taught us about sansai - mountain vegetables - on our first trip with them. Essentially, they're wild plants that people learned to eat and relied on for generations. It's utterly fascinating. I feel so radical when I pick and eat purslane! It is said that if you have purslane show up, you have very good soil. I like that, Lisa Anne. I'll have to tell that to the farmers I work with. They think I'm a bit mad to leave it in the garden, but we like to eat it too much to get rid of it. My theory also is that it helps mitigate some of the heat my kale plants might not be overly interested in this time of year.Thanks for reading!